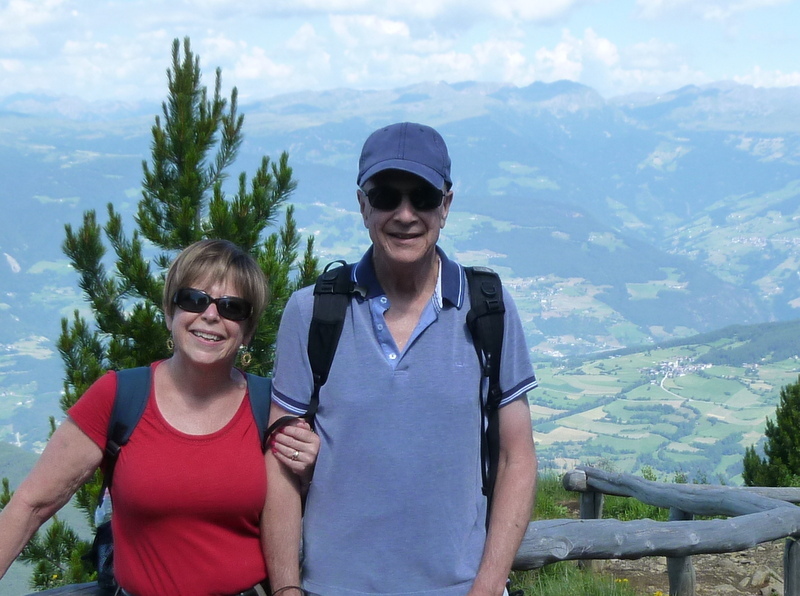 A nice Italian man – who lives in NYC – offered to take our photo high in the Alpe at Puflatsch. I am feeling rather German – or perhaps more accurately, Austrian – right now for three reasons. We are eating apple strudel every day. Even some of my high-school-and-university German is flooding back into my head, crowding the Italian I work so hard to speak. The other day I asked for a spiesekarte (menu) at a restaurant. What deep and obscure part of my memory bank did that come from? 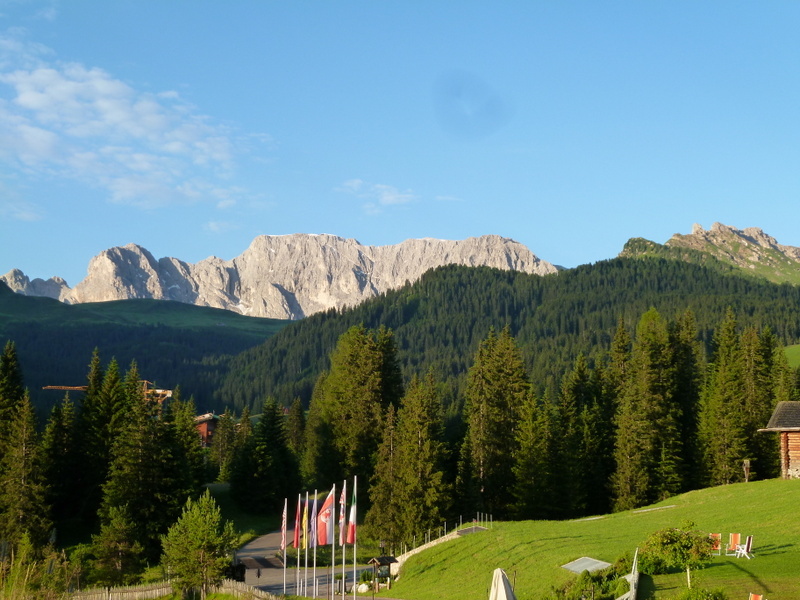 We are in far northern Italy, the Val Gardena, an area that was Austrian until the end of WWI and has kept its flavor more German than Italian. Here we see menus with spaghetti aglio, olio e pepperoncini alongside weinerschnitzel and strudel. Sunrise on the mountains as seen from our hotel at Saltria. 2012 trip to Ortisei and made a two-night stay in the meadow a priority this year so we could hike more up in the alpe (meadow). We chose the Hotel Saltria for its relative remoteness. One train, two buses and the cable lift/gondola up to the meadow made for a varied travel day, proving you can visit the alpe without a car. Hotel Saltria is a half-pension hotel: both breakfast and dinner are included in the per person price, something we’ve not experienced before, preferring to find our own dining options. Did I mention this place is remote? There are no other dining options. The food was plentiful and nicely done. 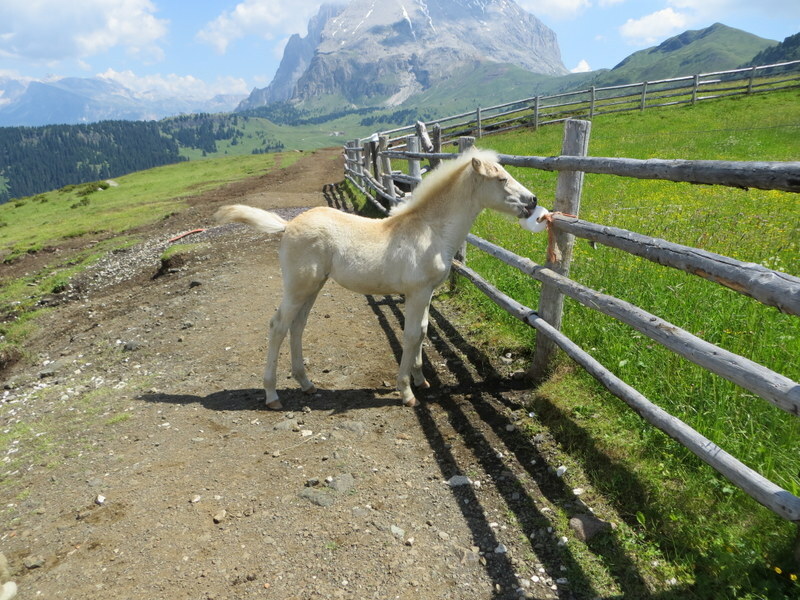 I didn’t really understand the Alpe di Siusi until we had visited. 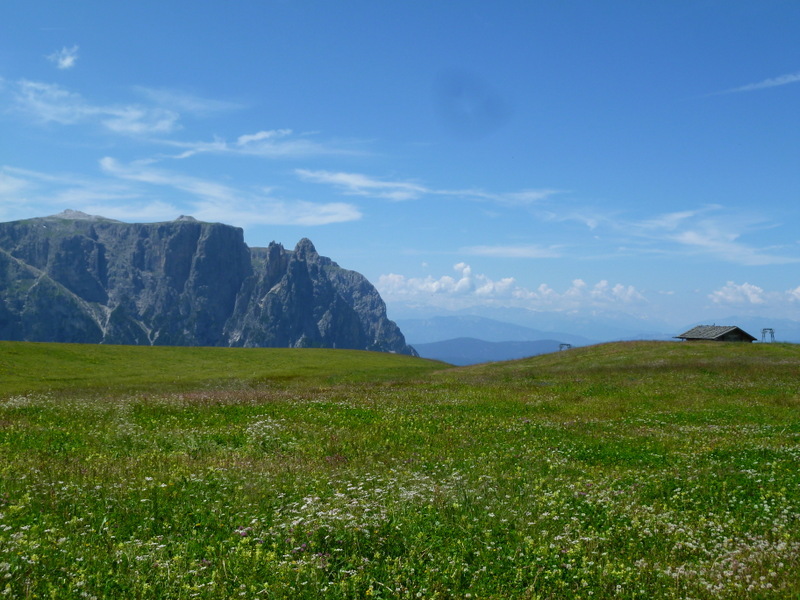 It sits at about 6000-6500 feet with mountain peaks towering over the meadow. The meadow is rolling, with tiny barns, haying operations, herds of cows and horses, crisscrossed with hiking paths for every level of fitness and dotted with wonderful little places called rifugi, refuges where one can take sustenance, quaff a beer, or spend the night. Ric said the word “refuge” brought to mind a rustic lean-to to shelter to use in case of inclement weather. Far from his description, in a rifigio you can find food to rival a café in a major city. Rifugio means a place to refresh, eat, even take a room for the night. Monday we took the first bus out of Saltria, connected to a chairlift at Panorama, and set out on a four hour excursion, a loop that had us walking to a point where we could make our descent to the hotel at the end. 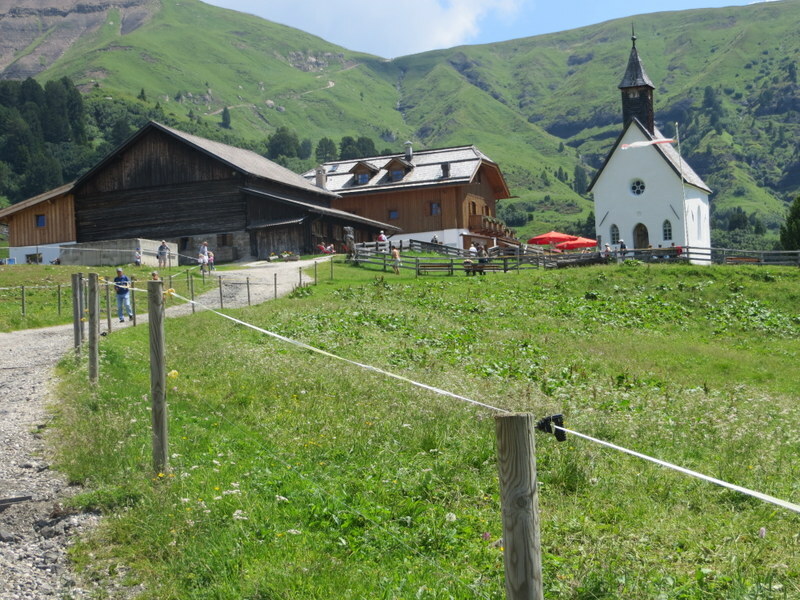 This up-and-down hike allowed a stop for second-breakfast at cute Rifugio Molignon, serving apple strudel and great coffee. We marched on through alpine splendor, ending at another rifugio for lunch before taking a final chairlift down. 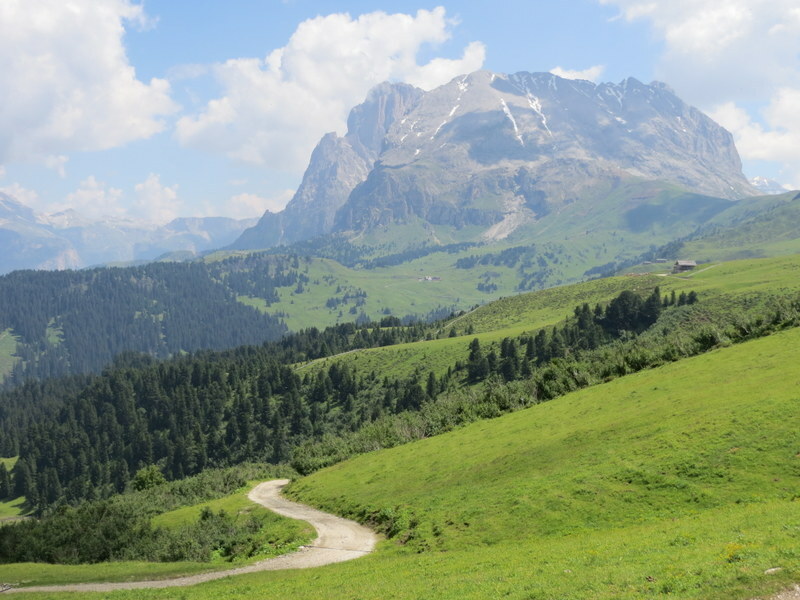 For those seeking this particular journey, and for the record so I can look back at this blog and remember, after ascending to Panorama, we hiked to Rifugio Molignon, and then on to Rifugio Zallinger, ending at the Florian lift, using trails 2 & 7. It’s briefly described in Rick Steves’ guide where he calls the hike “moderately strenuous.” We’d agree! Tuesday we only had time for a two-hour trek, but what a walk it was! 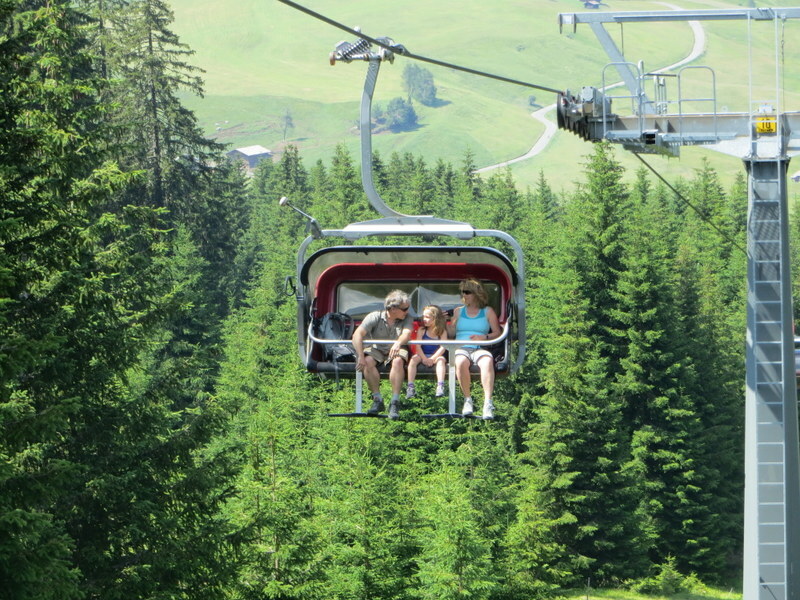 Taking the Puflatsch-Bullaccia chairlift, we toured the north side of the Alpe di Siusi, looking back at the previous day’s venue and taking in the view down into the Val Gardena and little Ortisei, where we were to spend the next four nights. 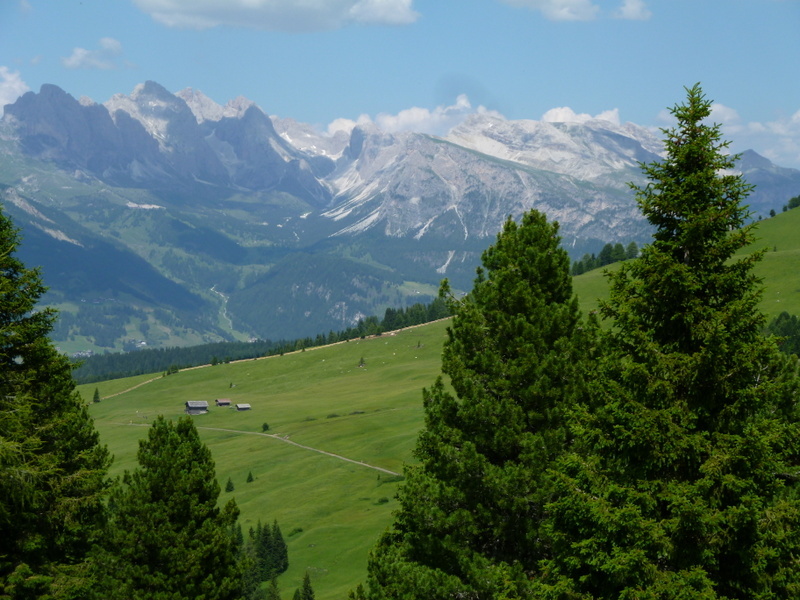 From the very edge of the Alpe di Siusi we could make out Castelrotto and see far to the north toward Austria before moving on to complete our hike, descend the Alpe and make check-in time at Ortisei. For the record, trails PU and 14 make a nice moderately easy loop. Well-signed trails make it easy to find your way. changes from lush meadow with wildflowers to alpine scrub, with rushing streams – some of which need to be forded – as well as forested glades. 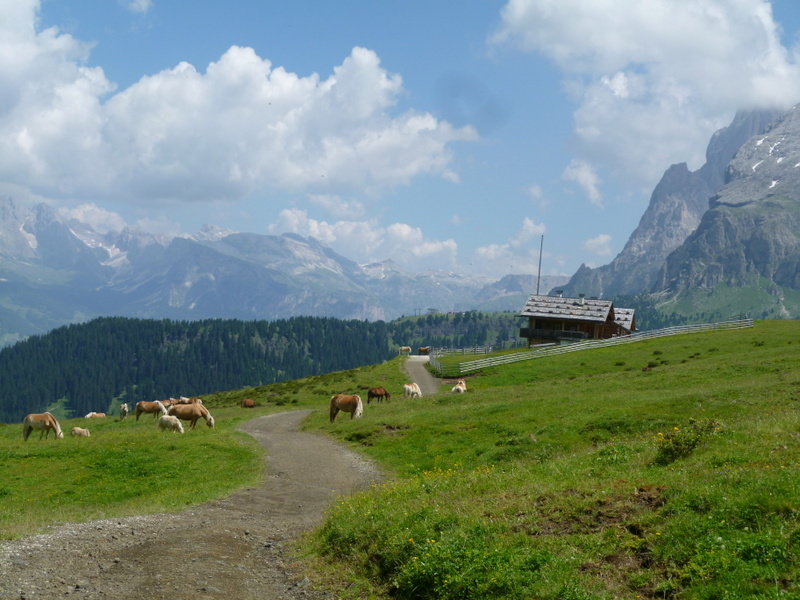 You hear only the sound of cowbells on the breeze, occasional bleating of goats, and the voices of passing hikers. Pure serenity seasoned with the odor of freshly mowed hay. Some paths are carefully laid rock while others are more traditional dirt. All are well-engineered for drainage. It is much easier to navigate than the Cinque Terre and much less crowded. We made it to Ortisei Tuesday evening. But that part of the trip will have to keep for another post. Time for dinner, but I cannot resist adding a few more photos to illustrate the beauty of this area. 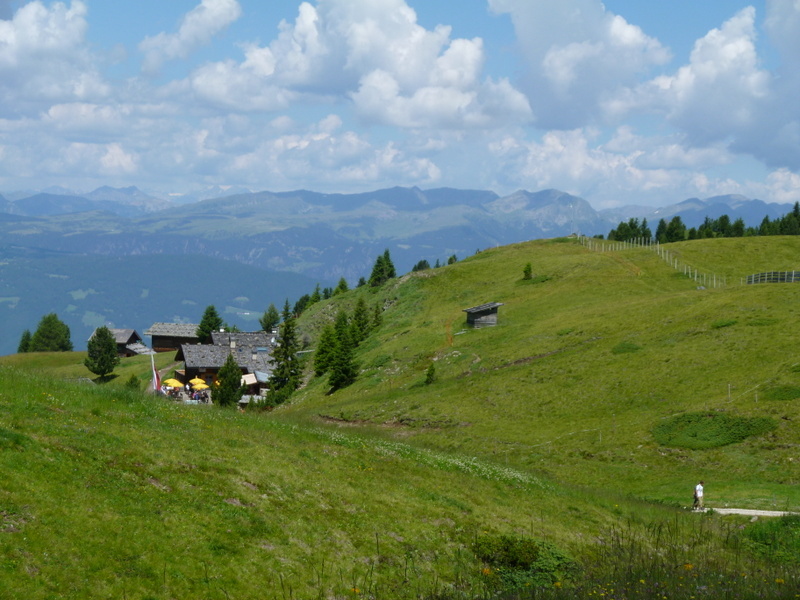 The varied landscape of the Alpe di Siusi. The way up…and the way down. Chairlift at Florian. One of the fun aspects of hiking here is seeing the path you travel unfurl behind or in front of you. 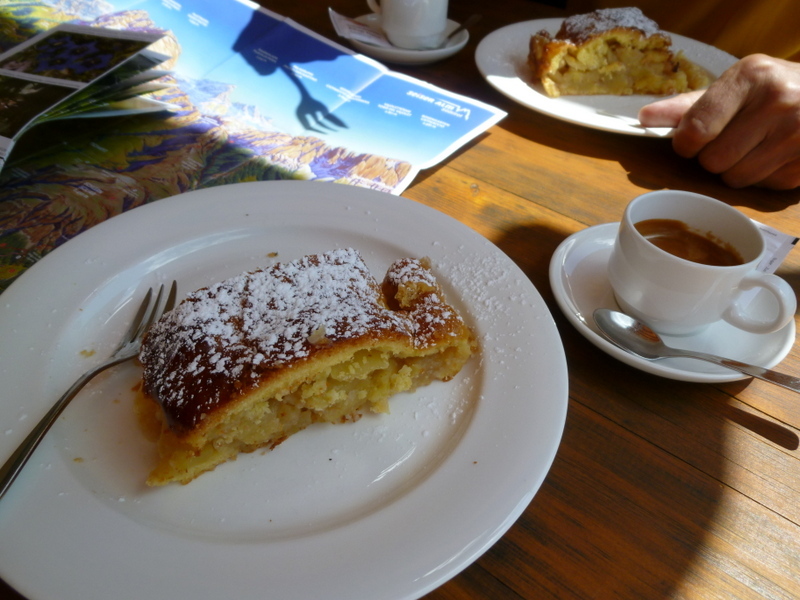 An apple a day keeps the doctor away….Does it count if it’s in your strudel? 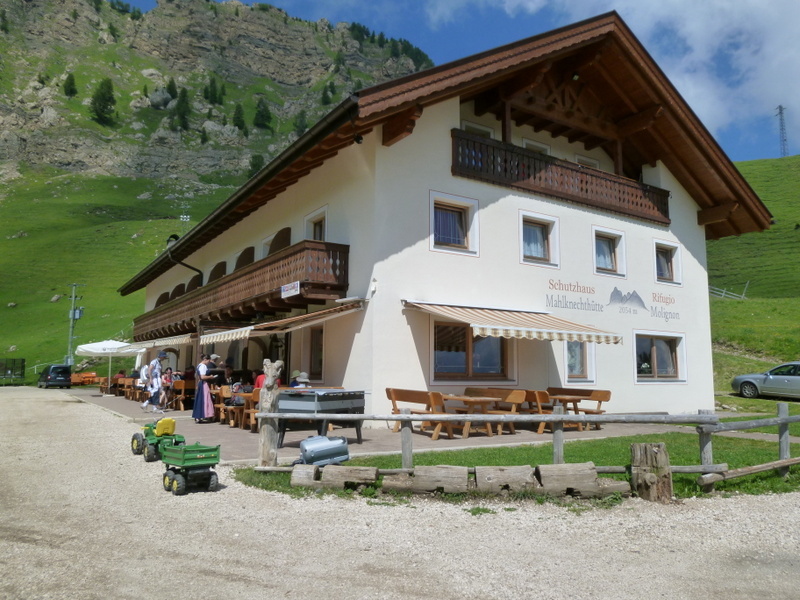 You can hike from rifugio to rifugio, for snacks, meals, rest, restroom. What a concept! One segment led through a pasture with horses and cows. Yes, this is the trail. Cows have the right of way. Oh, this is great information, especially since I will be visiting this region in September. But, I have a shopping question…can I realistically count on buying hiking boots in this region, larger foot, women’s 9.5 US or 40 EU? Maybe in Cortina or Bolzano? 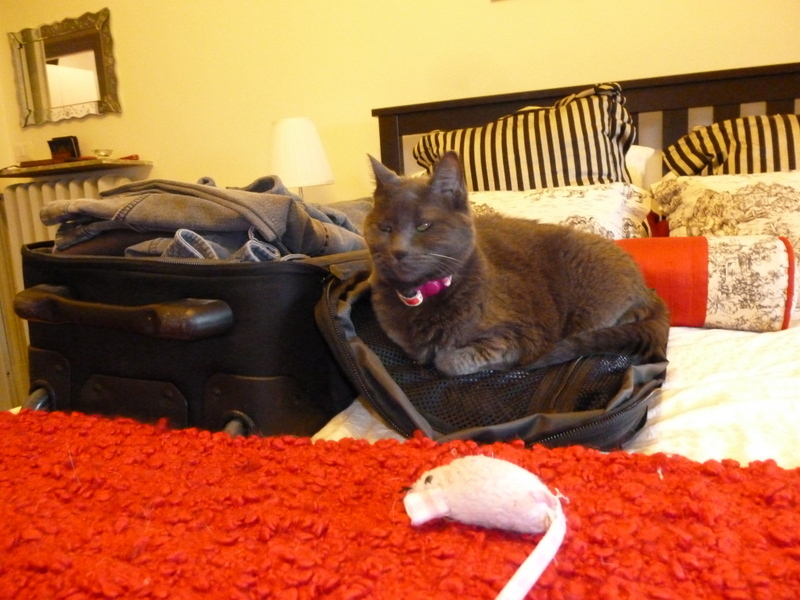 I don’t feel like carrying boots through my two weeks prior to the tail end of my trip. I have no use for hiking boots in Rome or the Venice Bienalle! Yes, I believe you can buy your shoes/boots there. We both bought them in Ortisei when we realized our walking shoes were not cutting it. In Ortisei there are a couple of shops we liked to the right of the main piazza. Ask for a recommendation on good soles for mountain hiking. Gorgeous photos. Did Ric also get a new pair of shorts? Saw Carl and Vern this morning and we had fun discussing your escapades. No longer a home owner and finally in our new apt. as of yesterday. All our love. STUNNING! I missed this part of Italy but will certainly make it a point to visit on my next trip. I enjoy your posts tremendously….it is like being there….well maybe not but pretty close! Legs are still Scandinavian pale! The glare would blind you! Absolutely stunning. Thanks for this post. It is so beautiful, it feels like a generous gift! You should come and see for yourselves! More to come about the last half of our trip. 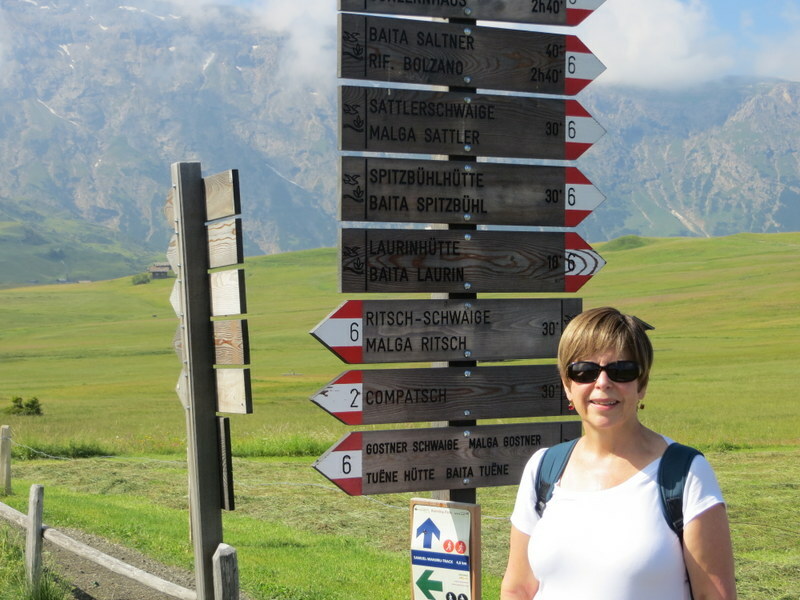 Hi Laurel, we visited the Alpe de Siusi for a couple of days in late May 10 yrs ago as part of a Rick Steves tour. I remember heading out for a hike up to a restaurant on a beautiful sunny spring morning – many of us wearing sandals. By the time we reached the highest point of our hike and had our lunch it clouded over and started to snow. It was a cold hike back to the hotel where we spent the afternoon in the hotel bar watching 4-5 inches of snow pile up outside. It was beautiful – I’ll always remember that day. Great story, Will! They told us there was 40cm of snow that fell at Seceda just 30 days ago! It can happen any time. I ALWAYS take a jacket for that reason. I loved this, Laurel. Thanks for all the details. I am saving them in case I can use your plan as a map for how to do it. I LOVED this area when we went through there, but of course did no hike. I am so glad you did. And the history of the region is as fascinating as it is beautiful. Unique, I think. SO GLAD you are doing this and loving it!!! More to come, Gayle! I have the rest of the trip to write about.